Enchanted (Disney, 2007) is by far one of the best films in its genre of Princesses overcoming obstacles in the path of true love. Princess Giselle (played by a radiant Amy Adams) finds herself in a whole other world where she falls in love with a man who is a prince in every way except literally. Enchanted caters to all ages from young kids to adults. It is funny but in a smart way. And it is fresh in that it takes many of the Disney tropes and turns them upside down such as the gender roles of Princes to the Rescue and Helpless Princesses. Enchanted starts out with a tongue in cheek montage (a wonderful animation) to classic Disney movies in which a Princess will stand at the castle window singing about true love even as she waits for her perfect Prince to arrive and whisk her off to happily ever after. The montage, of course, ends with the villainous evil step mother sending the Princess Giselle (played here by a radiant Amy Adams) to, literally, the real world of humans which, in the movie, turns out to be New York City where Giselle materializes as flesh and blood, and completely clueless, from an open sewer rather than, as is the form, falling from the sky i.e. heavens. The audience cannot help but laugh as the gritty and traffic packed New York City so easily absorbs and considers normal Princess Giselle—who is wearing a gorgeous ball grown complete with tiara, who speaks as if she’s just stepped out of a history book, as well as Prince Edward who comes to rescue her and is just as elaborately costumed and whose speech pattern is even stranger: ‘I am seeking a beautiful girl’ says Prince Edward to which the construction worker replies ‘So am I,’ and so the film is peppered throughout with very witty repartee thanks to the screenwriter Billy Kelly. I seriously doubt that this movie could have been set in rural Georgia or even downtown Atlanta, in fact anywhere other than in New York and that too, come to think of it, only in fact New York City. New York City, with its reputation of being an American city that can accept and take into stride anyone, does so with aplomb in Enchanted as the audience is treated to a splendidly elaborate song and dance number in Central Park featuring dancing buskers, mimes, and all varieties of street artists. One of the most delightful moments in the film is the first morning Princess Giselle finds herself alone in a very messy apartment. What does she do? Why, she decides to clean it of course and, to that end, requires a little help from her friends so she begins to sing and, before she knows, it she has gazillions of cockroaches and rats helping her clean up. It’s New York City, rats and cockroaches make sense, but it’s also discomfiting to watch a health hazard be ‘cute’ not to mention replace the likes of deers and rabbits, the traditional cute Disney animals such as in films like Bambi. However the only truly uncomfortable element in Enchanted is the portrayal of evil guy (played by Timothy Spall) who at various times in the film is a gypsy with an Arabic accent, an Italian who still sounds suspiciously enough like an Arab, and a Sikh (no question about it) with his orange turban and long beard. Why is the evil portrayed as foreign stereo types? After all Enchanted is catering to kids who, unlike adults, do not have the resources to know any better. This reminded me of Disney’s The Lion King and the controversy that followed over the villainous hyenas sounding like African Americans. 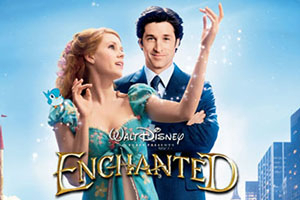 Despite the unfortunate stereotyping, Enchanted is otherwise a smart, funny and fun film. A big two thumbs up.